Have you ever been at home and found your furniture and flooring are not matching? Well, like every other aspect of our life, colours have been evolved over time for floors. And, people are putting conscious effort with time to choose the right colour that can go well with soft furnishing besides creating a suitable backdrop. When selecting the tile colours from our local tile suppliers Perth, you need to keep in mind a few things and the purpose of tiling your home should get the priority. Every room has a different purpose and frequency of use and hence, tile colour of one room might not work for another room. Did you know small and dark coloured tiles make your space feel small, whereas large and light coloured tiles give you the sense of open space and besides making it feel bigger. Moreover, the light and natural hues stand as a natural backdrop for your furniture and decor. These are the important aspects to determine the appeal of your property in the large segment of the market with respect to selling it. If you want to go by the current trend, you might see warm grey, off white and cream colours to lay out. What our experts suggest is brushed cement, porcelain, sandstone are much in trend. Moreover, if your budget doesn’t allow for natural marble and stone, modern porcelain or ceramic application take lesser cost and come lower in maintenance. In the last five years, the colour grey has become a most-wanted feature and came up as a durable alternative to concrete flooring. The grey is known for offering a neutral base colour to which you can add bold coloured furnishing. If you have a small bathroom, our experts suggest to have light coloured bathroom tiles, since these colours reflect more light than the darker one besides giving it an airy and spacious feel. You may try installing wall and floor tiles from Perth in the same colour, which can enhance the feeling of spaciousness. And, to bolster this effect, you can use grout in the same colour as the tiles are, and it would allow tiles being laid closer together for a seamless look. When pondering over what tile colour to use for your custom kitchens in Perth, consider a few colours like cream, brown and beige to create the impression of warmth. Even, a red, orange palette auburn against the wall will create a warm and more welcoming atmosphere. Lastly, consider natural colours for the patio. Being one of the tiled areas in the home, these areas are typically used for entertainment. It would be best if you choose to go with natural colours since it can get blended with the overall style and create a flowing feeling. Moreover, whatever the area of your home is, wood look tile can beautifully mimic the wood and decking that is placed on the patio. ‘Your Tile Test’- Which Type Fits Which Part Of Your House? The task of selecting the right tile for your home renovation is becoming more daunting by the day. So many designs with so many variants differing in size, texture and substance exist in the market. And the good thing-bad-thing about them is that each of them seems appropriate to fit anywhere in your house. Fortunately “Direct Tile And Bath”- your one-stop supplier of discount tiles in Perth provides you with a knowledge base on which tile to use at which part of your house. But Before That... Something Equally Important! Check The PEI Rating: PEI rating determines the durability of the tile in question. Tiles with a low rating like 1 or 2 prove suitable for low traffic areas, whereas those rated 5 deems appropriate for heavy foot traffic areas. This is meant for clay or porcelain tiles in Perth or other similar options. Checking The MOH Rating: MOH rating is mainly applicable for glazing tiles who come in a rating of 1-10. Any tile with rating 5 or above is meant to be impressively durable and suitable for normal flooring applications. Whereas, tiles with rating 7 or above is appropriate for extreme trafficked parts of the house- like the hallway. PEI and MOH rated tiles are best suited for the heart-and-soul of your house. Contrary, non-glazed tiles are notsuitable at all. The appropriate options would be to opt for textured glass or well-polished tiles. Porcelain tiles are the best option. Our experts will help you out with your flooring needs and even combine it with silicone- grouts to improve stain resistance. When selecting the right bathroom tiles in Perth, always consider the slippage-resistant factor. Again opting for glossy tiles for the floor could be inappropriate, as when wet, they become really slippery. Options which you could opt for include glass tiles, stone tiles, ceramic tiles, vinyl tiles, linoleum tiles, plastic laminate tiles and cork tiles. Your interior entree is the most trafficked area of the house. And so, when selecting the right tile; you need to go for options with higher MOH ratings. Rough-textured glazes are an adequate option as it conceals the dirt and withstands the foot traffic it receives constantly. Avoid any kind of designer tiles with MOH ratings of 3 or lower. A lot of people make the mistake of choosing low-quality clay tiles. Don’t make this mistake. Clay tiles can easily crack and chip away with more exposure to foot traffic and impact. For this area; our specialists suggest using giant porcelain tiles to reduce grout work and easy to clean. We have an impressive collection of top-grade tiles in Perth for your vivid house rooms. “Direct Tile And Bath” imports quality tiles from suppliers, and that allows us to keep our rates low and easily affordable for every buyer. Plus, we always update our catalogue to give you something new to see and choose on every visit. Feel free to check our catalogue. You will find the right tiles for different parts of your home. When you ask an expert, you will find everyone has different opinions for choosing tile size for the bathroom floor. Especially, when choosing the tiles for a small bathroom. It will make your small bathroom feel quite larger. So, while choosing the floor tiles, there are a few factors you need to keep in mind. Firstly, you have to consider the look and feel you prefer the most. As, you will be using the space every day, choosing the right bathroom tiles should match your needs and taste. So, how to choose the tiles for your small bathroom? Bigger the tiles, smaller the room will look. So, what we suggest is you shouldn’t use large tiles for the small bathroom. While using the small tile for your small bathroom, it can add a number of grout lines. And, It will make your bathroom look small. Either choose medium size tiles or choose the larger one with rectified edges. Make sure you will be using a grout colour that will be matching the tiles. Colour scheme: Go with the neutral colour scheme for the small bathroom. Light colours, such as cream, light Grey, white will surely make your bathroom look bigger. Tile layout to make a difference: It is a clever trick to use tiles for the small bathroom by lying the quality bathroom tiles from Perth in the diagonal pattern. It will really trick the eyes to see the space bigger than really it is. The logic is, when you lay them as a normal squared option, it becomes easy to count, whereas the diagonal patterns give the illusion of the longest dimension of your shower. Patterned or plain tiles: Whereas pattern tiles make walls visually advance, it makes the bathroom feel smaller. However, choosing patterned tiles can help you to add character by putting the patterned tiles under the dado rail height, and plain & light-coloured tiles above it. With this approach, you can draw the eye upwards while making it feel larger and lighter. Where to tile in a small bathroom? A small bathroom gives an unwelcoming feel if it is tiled from the wall-to-wall or floor-to-ceiling pattern. To enhance the feel of your bathroom space, you need to apply some decorative flow as much as possible. In case you find there is a gap of painted walls between the fittings and fixtures, it’s better to tile across the length of the wall instead of interrupting it. Right tile materials for a small bathroom: When it comes to choosing the best bathroom tiles from Perth, Limestone, slate and granite are the natural stone options due to low porosity and non-slip texture with a stunning finish. Whereas ceramic and porcelain tiles are affordable options with a range of finishes, they can come in bright colours, decorative patterns and more. Lastly, when it comes to measuring how much tiles you require, you can visit a reliable store and Direct Tile & Bath is happy to help you out regarding this matter. However, experts advice to add an extra 10% of the estimated amount while including the breakage and waste. Which is the Best Floor Tile Option for Home in 2019? We will vouch for wood look tiles as the perfect choice for decking up your home in 2019. It's in trend, and of course, the benefits are too many. It looks good. It's a perfect alternative to the hardwood flooring that is quite hard to manage. And, also, the price of wood look tiles are quite reasonable compared to the other options available in the market. But wait, the list does not end here. There are many more to it. Let us give you some valid reasons to prove our point. Did you consider the price difference between mahogany and knotty pine (the hardwood options)? It's distinct and visible. The patterns and quality of the real hardwood flooring determine it's price. However, that is not the case with the replicated version of mahogany or knotty pines though. The wood look tiles are made of the same material and manufactured in the same process. When it is about the longevity or durability of the flooring, the replication of the hardwood flooring is prone to last much longer than the original hardwood flooring. Also, the best part is that the replica does not wear out too quickly. It will look the same even after 20 years. Don't worry even if your friend spill some wine on the floor or accidentally drops any food, as unlike hardwood flooring; it is not going to persist for too long. Apart from acidic or abrasive cleaners, any cleaning agent can be used for cleaning up these floor tiles in Perth. Buy a mild soap and mix it with warm water to clean up the floor. And, you certainly know how much money can go down for polishing, waxing or restoration of the hardwood floor. So, choose the one that needs less maintenance. Well, just because you are shopping for the floor tiles that certainly does not mean, you have to buy for the small tiles only. Instead, just the like the large wooden planks, you can buy for the large size of the tiles too. Your house will exactly look like as if it is decked up with hardwood flooring. Not only for the flooring of your kitchen, drawing room or bathroom; instead, the wood look tiles are also the best option as bathroom tiles in Perth. For a sophisticated and natural finish in your bathroom, these tiles will just be perfect. These tiles are not prone to water damage. So, no matter how much water do your kids spill on the floor, all you need is a dry mop to clean it up. That they can easily do with the hardwood flooring, and, you undoubtedly know, how bad the floor can look when there are pet scratches everywhere on your expensive hardwood floor. So, if you have pets in your home and yet want the hardwood look for your floor, there is no better option than going for wood look floor tiles. Hope you have found all the reasons behind choosing wood look tiles for flooring! Want to talk to our experts for delivery, price and discounts? Don’t delay to call us up and renovate your home with a modern touch. Bathroom renovation is an easy process and at the same time, a tough one! Sounds contradictory? Not at all! It’s an easy task if you know the way and if you have put your money on a reputed name, and tough if you HAVE NOT! Well, let us get right into it! You have to be rather thorough in your approach while renovating your bathroom. For that, you indeed have to bank on a name that will make a difference. That is where we at Direct Tile and Bath score over other companies. We not only come up with impeccable bathroom renovations, but our experts also provide you with some groundbreaking ideas that can make your bathroom, the very focal point of the aesthetic value of your entire household. And it's not that these ideas have only to do with cheap floor tiles for bathroom available in Perth. They have to to with everything - starting from things related to your bathtub to the kind of mirror you use and the way you mount it on the wall. Here are some fascinating ways to make your bathroom look unique when you renovate it. Is your bathroom a bit on the smaller side? If so, then there is nothing to be worried about. You will find a lot with smallish bathrooms these days, and our experts have unique ideas of renovating them. We have some opulent fitting and fixing ideas up our sleeves that will take the aesthetic look of the bathroom to an altogether new level. And it does not take too much to make that happen. Just a few innovations here and there will make the difference. A great way of adding spectacle is adding a floating vanity or two mounted against the walls. It will add quite a few scores! Remember, how those tiny square tiles used to dominate the bathrooms way back in the eighties and the nineties? They still do so at present, if you know the way of using them - albeit with a few differences. Again, our experts will come into play to add some innovative ideas. They can pick up those subway tiles from our tile warehouse in Perth for the purpose. These subway tiles come up with a string of benefits, which make them more popular than their smaller counterparts. They are famous for their classy look, and they can be cleaned easily. Subway tiles are excellent as they expose lesser grouts to all the moisture of the bathroom and this means the probability of accumulating moulds and mildew are less. The look also remains simple yet very much contemporary. Installing freestanding baths IS A GREAT idea to come up with a bathroom on a budget. These baths have a distinguished look and are space efficient as well as extremely manoeuvrable. Contact Direct Tile and Bath, and we will be able to provide you with the right kind of bathtub that will ‘gel' with your bathroom. So you see - it is all about adding some ‘pretty little' things here and there that makes all the difference. Things like frameless screens or just a little revamping of the lighting here and there will do the trick for you. Get in touch with us at Direct Tile and Bath at the numbers you find on our official website. Our officials will get in touch with you and provide you with invaluable suggestions. We at Direct Tile and Bath have a wide array of tiles for you. Such is the vastness of the range of our products it may leave you utterly perplexed. That is pretty obvious - for too many options at times might leave you confused, though that is undoubtedly a positive sign. In case you are still not able to make up your mind and decide between wood look tiles and the sandstone variety, if you have zeroed on these two, here are a few tips that will help you to arrive at a decision. Here is where the basics start from. It involves taking into consideration a few guidelines when it comes to selecting the tile type and shade. You need to consider the purpose of the room. Since every room has a specific intent to fulfill, that should determine the type of tile you choose. For instance, the wood look tiles are a shade darker than their sandstone counterparts and are best when it comes to giving a closed, cozy and compact look to a room. The sandstone variety, on the other hand, would provide a tinge of openness and airier aesthetic to the room. When it comes to tiling your kitchen, the sandstone variety will be more apt for obvious reason. Remember, tiles that are darker tend to make spaces appear smaller than they are. However, the lighter ones would open them up, and make them look more prominent than what they are. That's what you need to consider when you pick up tiles for your Myaree home. As an interior pundit has put it, “Brushed cement tiles, tiles made up of sandstone, white marble, porcelain are much in vogue at present, for tiling your bedrooms and living rooms.” Indeed so, for if you are planning to use tiles for your living room, the lighter sandstone variety will be a better idea. Again, if you are planning to opt for a substitute for concrete flooring, then you need to turn to the wood like variety. Presumably, they are the lighter variety, which is a durable substitute to rendered or concrete flooring. The greatest thing is that these wood look tiles in Perth give your floor a neutral base, which will provide you with the option of setting up coloured softer furnishings. Regarding the bathrooms, more so if you have a smaller one, you need to have the light coloured ones, which will reflect light more than if you have the ones with darker shades. This will form an airy and more spacious illusion. Here, we recommend you to use tiles with the same colour and texture, as that will further enhance that illusion of spaciousness. For further bolstering this effect, you are recommended to use the same textured grout, or you can purchase custom cut tiles, which will lead to a more seamless look. So that is it. Patios look better with wood look tiles, while for the kitchen the sandstone variety is more apt. For further advice, call us up the number you find on our website. Our expert will be more than happy to provide you additional information before you starting tiling your home. Colourful Bathroom Tiles - Do They Make a Good Option for Renovation? Not everyone really is fascinated by the use of colour pallets in their bathroom. But if you want to add the dash of freshness to the place, going for colour is a must thing to do. Well, when it's the bathroom, we will not tell you to get the acrylic painting done on your bathroom walls. Instead, we will ask you to go for coloured tiles instead. Among the solid coloured tiles, black and white are indeed the two most popular choices that people often consider to have. But, honestly, there are a lot more to it that you should also consider making sure you can secure the desired look for your bathroom. Not every homeowner treat their bathroom as just a place to get a shower to freshen up. But, some find it as a relaxing zone where they will unwind their day's hard work. For that, the ambience of the room should have that sort of vibrancy. And, that, of course, can be achieved as you choose to go with colourful bathroom tiles. Now, it’s time to help you out a bit with your selection. What to choose from the most popular options are considered in the following section. The colour choice will be varied based on the amount of light play you want in your bathroom. If you are not prone to too much of glare (which is not a preferred choice at all! ), choose a colour that is non-reflective, somewhat works as a light absorbent. Choosing matte finished bathroom tiles in Perth is also a consideration here that you are required to keep in mind. Those who have a small bathroom often deal with confusion regarding the choice of coloured tiles of course. They try to make it look as spacious as possible by not adding many features to it. However, using tiles featuring soft pastel colours will be the best thing to do in this case. The soft tones cause a visual expansion. It will also make your bathroom look contemporary as well. Well, choosing solid coloured cheap tiles in Perth does not obviously mean that you cannot go creative or innovative. You have so many options to experiment that the patterns you can create will be endless. What kind of ambience do you want? If it is a meditative ambience you want, then merge the neutral colour patterns. Brick, basket weave, checkerboard and herringbone are the popular colour pattern choices you can go for. It is true that you have to stick to your personal taste of colour regarding the choice, but you also need to understand, which colour will suit your bathroom the most to make sure your investment is worthy enough. Don’t worry about the price, because being the market leader, we know how to keep the entire bathroom renovation process within budget and still add that freshness to your bathroom. Talk to the experts of Direct Tile and Bath for any sort of consultation with the tiles and choose from the pool of choices it has to offer. Laying ceramic tiles is not rocket science. Everyone can lay them with a little patience and with appropriate tools and accessories. However, being able to lay the tiles is one thing, and laying them perfectly is another. Laying of ceramic tiles need a lot of preparation and the task is pretty challenging as well. This is the reason, the involvement of professionals is an absolute imperative for the perfect laying of the ceramic tiles. Quality makes a huge difference in this task. People at times make the mistake of not summoning a professional and then opting for cheaper tiles. This will have a double negative impact. Firstly, the tiles are not laid perfectly, and secondly and more importantly they are not durable. This is where the professional intervention makes a difference. A competent company will always put emphasis on the quality of tiles and will make sure that the laying is perfect with the use of appropriate tools and accessories. These companies will also prefer that their customers opt for the best when they buy tiles either online or from the brick and mortar stores. Another factor that might justify the involvement of quality professional companies is that the professionals of these companies, by virtue of their experience, are able to spot out even the slightest lack of uniformity while laying tiles. This is something that you may overlook while trying the DIY stuff. Thus, you see how the involvement of a professional company helps in perfection while laying ceramic tiles. The best in the business like Direct Tile and Bath would always follow perfect procedures while laying tiles. For instance, we will never lay the newer tiles over the layer on the older ones. Well, at times we do practice that, but only under certain circumstances. We do it only when the older ones do not have any sealant and if they are perfectly clean. Understandably, all these are pretty complicated affairs that are related to laying of ceramic tiles in your Perth home. Naturally, only professionals with a considerable experience in its kitty will be able to do the job in a perfect manner, taking up all these challenges. It is true that you will find a wide range of ceramic tiles on the net. However, when it comes to picking one of them, your selection might not always be that perfect. You are not to be blamed for that though! You are after all, not a professional. Hence, the involvement of a professional company will always make a difference. They will guide you to pick up the best tiles from a crowd of products that are available online. Hence, if you are looking forward to paying ceramic tiles at your home, make sure you contact us. We at Direct Tile and Bath will come up with a perfect service that will not only meet your expectations but will go way beyond it. And that also at a cheap rate. While you are thinking of renovating your bathroom or kitchen, tiles indeed become the very first thing to grab your attention. Apparently, choosing the right floor tiles seem to be a tricky task for some, but, selecting the wall tiles also require a specific amount of effort. Before we go further into pointing out the tips to choose wall tiles for both bathroom and kitchen, it is essential for you to know the basic differences between the wall tiles and floor tiles. What Is the Difference Between Floor and Wall Tiles? Even if the material seems to be the same, but still there are some differences. Mainly, it's the visual difference. For example, you can easily find a wide range of both porcelain and ceramic tiles for the floor as well as for walls, but both of those will never look like same to you. Also, the best ceramic wall tiles in Perth are mostly created with a lighter body compared to that of the ceramic floor tiles as it does not have to take so much of foot traffic. The modern trends in tiling have brought a huge change in the old methods of laying the tiles. Now, some people prefer to lay big floor size tiles on the walls of their kitchen and bathrooms too. But, the highlighted differences will always be there. Now, it’s time for the tricks that you are meant to follow for picking the right wall tiles. Find out in the following. It's essential for you to take note of the lifestyle of your family members while choosing a tile. For example, if you have kids in your home who likes to draw on the wall quite often, you will need something more durable and also resistant to such wear and tear of regular use. So, consider the habits of your family members to choose a tile offering better longevity. Having a completely white kitchen interior is the fascination for some people. If you are one of them, choose white gloss tiles for both kitchen and bathroom as because gloss tiles are easy to clean. However, if you want to go for a bit darker side, choose the matte finished darkly shaded wall tiles. Remember, solid colours are the flavour of this year. So, choose accordingly. It's true that the finest wall tiles turn out to be the biggest attention seeker in the room, but that does not mean that you will get sold by the appearance only. First, make sure, it is suitable for the wall. Next, you cannot just go by the look without caring for your budget. You will also get the finest quality wall tiles within your price bracket. All you need is a little research. Save money on the purchase of porcelain and ceramic wall tiles from Direct Tile and Bath, one of the best tile stores in Perthpaying our FACTORY SPECIAL PRICE. As we supply our products directly from our Perth warehouse, we can keep our price range low. Visit our ‘Trade Store’ for checking out our exclusive collection of wall tiles and invest as per your choice. Why Porcelain Tiles Are a Fast-Forward Flooring Option For Bathrooms? You will find a lot of homeowners festooning their bathroom flooring with porcelain tiles. These tiles are denser, less porous and harder in comparison to ceramic tiles. They offer greater stain and water resistant abilities. And they are appropriate for radiant-in floor heat to keep the floor toasty on cool and pleasant mornings. Another trait of porcelain tiles which helps it garner attention is its versatility. These tiles can mimic the appearance of natural tiles namely granite and limestone. Porcelain tiles are available in an array of designs, styles and shapes, and for all these reasons you should consider flooring your bathroom using them. Still not convinced? Don’t worry, here’s stating more on why they are such a fast forward flooring option for bathrooms. Porcelain tiles are known for their ability to withstand wear and tear over the years as standard ceramic tiles. These tiles have few air pockets, comprises of denser materials and tends to be more consistent in construction. All porcelain tiles from Direct Tile And Bath are thicker than most tile variants and last for a very long time. So, if you wish to install quality bathroom tiles in Perth which looks gorgeous over the years and is less prone to breaking, then our manufactured porcelain tiles will hold up rather well. Porcelain tiles work great for surfaces which receive high foot traffic. These floors are resistant to wear, breakage and even against those sharp nails of pets. In that case, such tiles are appropriate to install in bathrooms where the surface is exposed to water all the time. Regardless of the abuse of everyday life, porcelain tiles will retain their appearance, and you don’t need to spend hours on its maintenance. If you have opted for traditional hardwood flooring, then maintaining it can be a tough task. Fortunately, porcelain tiles don’t involve any such maintenance requirements. There is no special kind of sealing which keeps the water out from the tiles. You can wipe the water from the tiles without causing them any harm. This is yet another good reason why they are such a popular choice for bathrooms and kitchens where moisture exposure is common. These are some rational reasons why you should think of using porcelain tiles for your bathroom. We have a wide collection of quality porcelain tile options for your bathroom flooring needs. From non-slip matte finish, glossy or smooth tiles to tiles with glazed finishes; we have all your vivid needs covered. Furthermore, Direct Tile And Bath, being one of the top tile suppliers inPerth, also has porcelain tiles of the latest designs at budget-friendly costs. Our tiles are available in sizes beginning from 300x300 (perfect for bathroom floors) to 1200x600 more apt for larger bathrooms or kitchen floors. If you have any problem in choosing your flooring option; our experts will help you out in making the right choice. So, feel free to browse throughout impressive collection today! Bathroom renovation isn't a headache, but few of the small details can turn up to be a massive problem if you haven't paid proper attention to them. Here is where the installation of subway tiles comes as a factor that requires not just attention, but a bit of professional care to. ...you neglect your bathroom (no offence). Have you already decided to buy these tiles for your bathroom? Then you'd better hold on a bit. It is because you may completely ruin the outcome you pictured when these tiles aren't cared by professional means in case of their installation process. This blog will aim to help you with some quality knowledge about what professionals do in such a project. Most pros wouldn't ever think of installing subway tiles without a ledger. The thing is that subway tiles have a very clear borderline and such prominence is taken as a fundamental factor in their elegance. Not using a material for ledger may make the alignment curved. It is a serious discomfort to the eye. Plus, it may loosen the tiles at their grip with the wall. A proper bathroom renovation by subway tiles in north of river Perth is going need a supportive wooden piece at the first rows of the tiles. This step gives the pros an idea about how exactly the alignment should be. Plus, the entire process becomes much easier. The tile cutter is a tool that doesn't sound so serious, but using it is very serious. There are a variety of tile cutters out there and you may not know which one you need only for subway tiles. Besides, a slight mistake in using them can make you face accidents and damage a subway tile permanently. Not including the right spacers can be a serious error. However, this factor can be applied to other tiles but not with subway tiles (at least not with most of them). What professionals do is that they check the tiles for those spacers and apply it only if you need a very thick grout line. In most cases, you don't need such thicker looks at the grout by your subway tiles in Perth for bathroom renovation. It doesn’t look so good and will get dirtier with time too. 4. Time for the Edges! Well, in most cases, the edges of these tiles can ruin the looks if you haven't calculated edging them properly. Pros go for measuring the tiles and checking if they are going to be uniform with the edges of the walls. They make additional efforts if the desired outcomes don't happen based on the measurement of the tile and the space at the walls. Pros know that the binding material would keep on extracting itself from the grouts the harder the tiles are pressed to settle onto the surface of the walls. If they don't keep on cleaning that extra residue being extracted, then it may get stuck due to getting dry. You'll need the right product for the right installation. Well, why don't you contact the officials of Direct Tile and Bath? The brand has a variety of products. But, the more interesting thing is that the staffs there can help you to choose the right subway tiles you need for your upcoming bathroom renovation. When installed, these subway tiles will make way for a splendid time inside your bathroom. How Porcelain Tiles SUPERSEDE Ceramic Tiles? Know NOW! Most homemakers consider the Holy Grail of Construction Materials as those which require little or no maintenance. Fortunately, there is one option which you can avidly use for your house decor purposes- and believe it, that it’s not some miracle of nanotechnology. 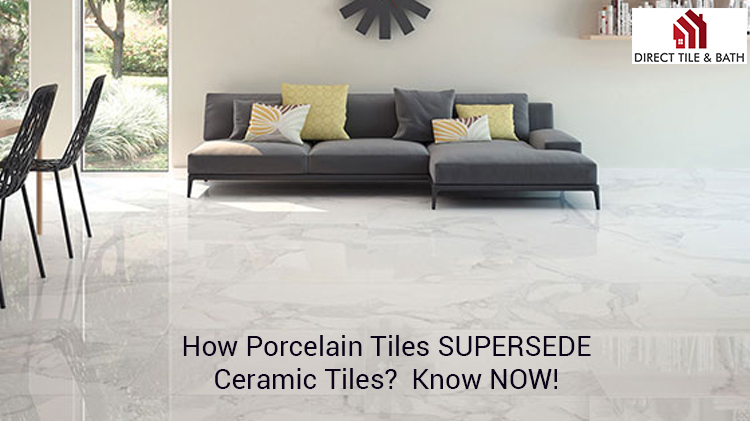 Rather it is an age-old option which you have heard about numerous times - Porcelain Tiles! But, today’s porcelain tiles are better updated with modernistic equipment to make it more impervious to water. Furthermore, these quality tiles in Perth won’t crack in freezing temperature and can be used for both indoor and outdoor construction work regardless of the weather conditions. These tiles are a popular choice for many home designers as they use this for a broad range of applications. The Comparison: - Porcelain or Ceramic? 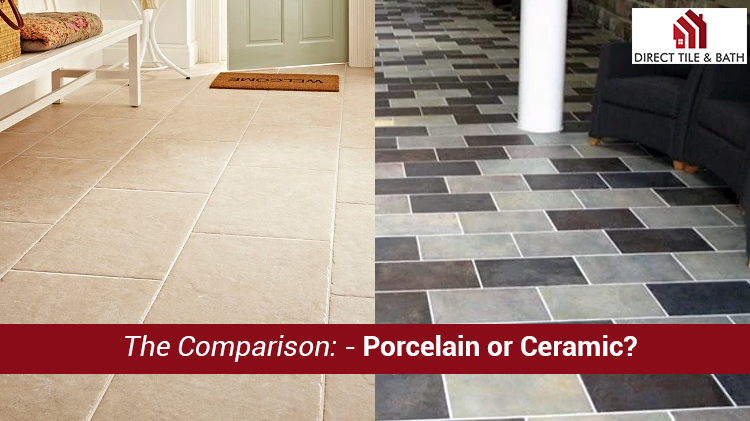 One common dilemma which most homemakers face is deciding which one among- Porcelain or Ceramic tiles are better for their kitchen, bathroom or living room floor! If you are facing this same confusion, then ideally you need to opt for an option that is durable and practical. Both Ceramic and porcelain tiles have unique characters of their own and what makes one better than the other will be discussed below. Follow closely! · Ceramic is a type of semi-crystalline material, is amorphous and inorganic by nature. On the contrary, porcelain is a kind of ceramic and is prepared using fusions of clay. · Porcelain tiles are also totally vitrified and impermeable before its glazing treatment. Whereas ceramic tiles do not undergo complete vitrified treatment and most of the times, remains porous if not glazed. · The proportion of water absorption is also higher in porcelain tiles as compared to ceramic tiles! And that’s what makes it expensive than ceramic. · Finally, ceramic tiles are lesser dense, and that makes them easier to cut into shape. Contrarily, porcelain tiles are much heavier than ceramic tiles, thus making it tough to cut. - Most quality porcelain tiles in Perth are fireproof. Even in testing conditions, it doesn’t burn; rather it restricts the flame’s movements at the time of a fire outbreak. - Porcelain tile are your friends for life. Once installed; you don’t have to worry about future installations. Regardless of the excessive foot pressure, or lack of maintenance, these durable times can last well over a couple of decades (maybe more). If you are looking for a good option, there are very few that can match up to the performance of porcelain tiles. So, with everything known and understood, contact a reliable trade store and set up your order. If you are lucky; you may also get discounts on your bulk order. If you are in a rush for this; you can try out ‘Direct Tile and Bath’. Just check out some of the options available (with the prices off-course). If interested; you can even speak to their representatives.